Seattle Oasis Vacation Rentals is a small, family run business looking to help you “Redefine Accommodations.” All of our vacation rentals are located in downtown Seattle within walking distance to all the great activities and local attractions of the city. Our units are professionally designed and boast the comforts of your own home. Each of our Seattle vacation rentals offer an amazing view of the mountains, sound, or thriving city of Seattle. Located right in the heart of Seattle, you can leave your vehicle in a secured garage and walk to many things that Seattle has to offer! We strive to make all of our guests feel warm and welcome by offering a variety of services. From the granite counter tops in the kitchens, to the 500 thread count sheets on the beds, we have cut no corners to ensure you a vacation rental to remember. 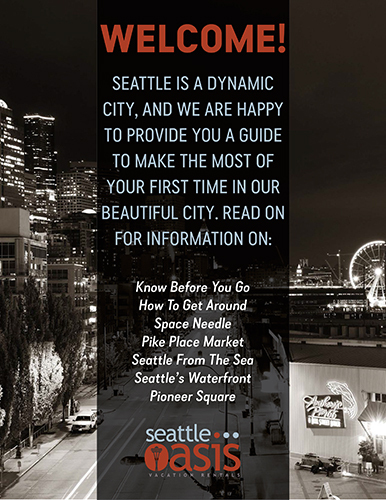 We at Seattle Oasis look forward to hosting you on your next Seattle vacation! Contact us today to learn more about our top vacation rentals in Seattle Washington!